But what haunts Swaroop, an associate professor of surgery at Northwestern University Feinberg School of Medicine, was how the victim’s mother responded. “She fell into my chest, and she’s crying and she’s yelling and she’s screaming. And those screams and those yells are in my bones,” she said. Determined to save others from such pain, Swaroop developed a course to teach bystanders how to treat gunshot victims. Since January 2017, she has reached more than 700 Chicago high school students and community members. “I’m in the community teaching this course so that maybe the trauma bay won’t have – at least – another mother’s screeching voice,” she said. 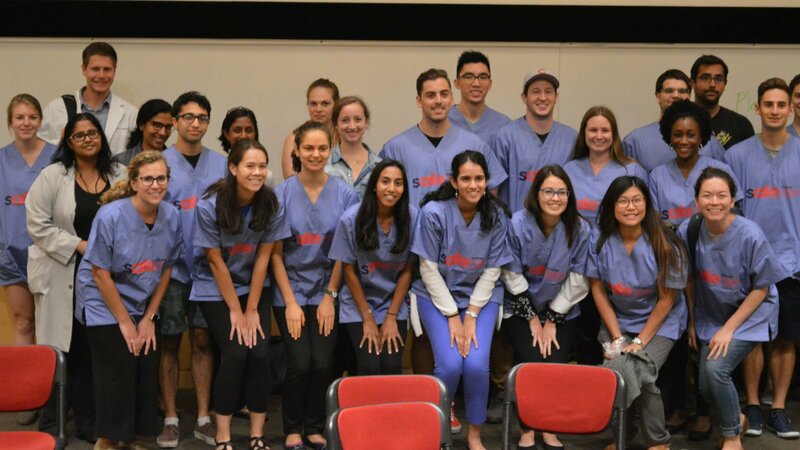 Swaroop shared her story Monday at Northwestern during an event organized by a new national organization composed of health care professionals called Scrubs Addressing the Firearm Epidemic. Northwestern was one of 30 medical schools across the country hosting events to educate the health care community about gun violence and empower them to take action. Events were also held at the University of Chicago Pritzker School of Medicine and the Chicago Medical School at Rosalind Franklin University. Connecting with patients is critical, said Mariah Lank, who was shot on May 31, 2016. “The simplest thing is to build a relationship with a patient because you never know what the patient is going through,” Lank said. Sharing stories about working with patients and families is one such action, said Rebecca Levin, who has been working on gun violence prevention for 17 years. “You have heartbreaking and heartwarming stories to tell of your patients, to share so policymakers can understand how gun violence affects real people,” said Levin, the executive director of Strengthening Chicago’s Youth, a gun prevention collaborative convened by Ann & Robert H. Lurie Children's Hospital of Chicago. Levin says health care providers can also talk about gun violence as a public health issue, and call for an end to the federal freeze on gun violence research. She also called on attendees to urge Gov. Bruce Rauner to sign SB 337, also known as the Combating the Illegal Gun Trafficking Act. The bill would require gun dealers to safely store firearms at all times, as well as make copies of FOID cards or IDs and attach them to documentation detailing each sale, among other things. Levin brought postcards for attendees to fill out and mail to the governor. Monday’s event included a moment of silence for Shane Colombo, a Northwestern medical student who was killed by gun violence in the Rogers Park neighborhood earlier this month. Representatives from Chicago Survivors and Cure Violence were invited to attend the event but had to cancel due to scheduling conflicts, according to Swaroop.